The Skinny: Agreeable Lunar New Year comedy that's actually quite annoying in its inanity. Still, the whole thing is so harmless that hating it would be like kicking a small dog. by Kozo: This warm and fuzzy family comedy is a pleasant, amusing diversion with all the typical HK New Year’s elements: big stars, loose plot, and gags that are occasionally funny, but also fall flat all over the place. The plot: Tony Leung is a stuttering comic book artist who loves lovely schoolteacher Anita Yuen. However, frigid sister Carol Cheng disapproves of the union, but is undone by a budding romance with creepy family friend Lau Ching-Wan. 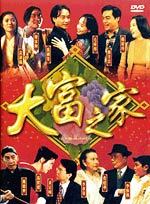 Lau really wants rebel daughter Teresa Mo, but she pretends to be in love with her bohemian pal Leslie Cheung to avoid the situation. Cheung becomes everybody's whipping boy because they think he's a bohemian layabout, but eventually he turns out to be so nice that everyone changes their minds. Also, Raymond Wong shows up in a Mrs. Doubtfire parody. He's a dad who wants to see his daughter so he dresses up like a housekeeper to fool ex-wife Fung Bo-Bo. And if that weren't enough, there are Jurassic Park musical sequences (?) and a major supporting role for Master Kwan Tak-Hing, possibly the most famous Wong Fei-Hong in Hong Kong Cinema history.